Jacques Cartier was a French explorer. Cartier wanted to find a route known as the “Northwest Passage”. Ships from Europe were sailing around Africa to get to India and China. It was believed that the Northwest Passage would provide a shorter route. If one found the Northwest Passage, a ship could reach China and India from the Pacific Ocean instead of the Indian Ocean. Cartier made three expeditions between 1534 and 1542. Cartier did not find the Northwest Passage, but he did explore the Saint Lawrence River and other areas in Canada. On one expedition, Cartier built a fort (营地) for the winter. Toward the end of the winter, Cartier’s men became ill. Their arms and legs swelled (肿胀). Their teeth became loose and fell out. Many men died. The ones who did not die were too weak to even stand up. The men did not know it, but they had scurvy (坏血病). Scurvy is a disease caused by a lack of vitamin C. Only Cartier and three of his men were healthy. Cartier was worried that the nearby Native Americans would attack his fort if they knew the true condition of his men. For that reason, whenever a Native American came close to the fort, Cartier and his men shouted and sang. They made noise by banging ( 猛敲) sticks. They made it sound as if many busy, happy, and healthy people were inside the fort. One day when Cartier saw a Native American he knew, Cartier went outside to talk with him. Cartier said that just one of his men was sick. Cartier asked how the Native Americans recovered from the disease. The Native American pointed to an evergreen tree. He told Cartier how to make a brew from its leaves. Cartier immediately made a brew and his men quickly recovered. 1. Why did Cartier want to find the Northwest Passage? A It was a short cut from Europe to Africa. B He wanted to sail around the Pacific Ocean. C He wanted to find a safe route for explorers. D It made it possible to reach China and India in less time. 2. Which of the following can best describe Cartier? 3. The underlined word “it” in Paragraph 3 refers to the fact that _____. 4. Cartier’s men became ill because _____. 5. Which of the following statements is TRUE according to the text? A All of Cartier’s men were Americans. B Cartier found the Northwest Passage. C Cartier and his men were good at singing. 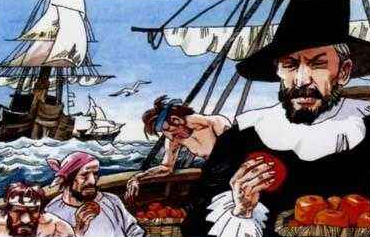 D Native Americans knew how to cure scurvy.